To reach the lost in a multi-ethnic, digital world, we need a church committed to the vertical and horizontal. We need a church committed to saving the lost and transforming communities; to addressing sin and confronting injustice, pro-life issues, and pro-poverty alleviation; and to ending religious persecution and human trafficking. To fulfil the biblical mandate to make disciples, the American church must intentionally exercise compassionate outreach to fulfil the Great Commission. Viable, compassionate, immigrant outreach may very well serve as the balm of Gilead in healing the current strife between native and immigrant. Even more important, compassionate evangelism may result not only in the salvation of the immigrant community, but also in the salvation of the North American church. As we contextualize 21st-century North American Christianity, we must apply kingdom optics that will enable us to properly view our surroundings with Christ-centred and Spirit-filled compassion. North America currently exhibits a dramatic transformative shift in its demographic landscape. This requires strategic deliberation for a kingdom culture multi-ethnic outreach that will transform the face of Christianity in America. Any church committed to a viable 21st-century growth matrix must include an immigrant outreach strategy that includes compassion ministries. A clear and practical articulation of a biblical worldview based on the message of the cross will empower compassionate outreach to the immigrant. Why the cross? The cross represents the quintessential platform from which to do ministry. No other symbol incorporates passion and promise like the cross. A simple symbol depicting two pieces of wood—one vertical and the other horizontal—successfully brands the eternal hope of glory to all mankind. Vertically, we stand connected to God, His kingdom, eternal life, spiritual truths, divine principles and glory. Horizontally, we exist through community, relationships, family, culture and society. For far too long, people have lived either vertically or horizontally, but few, even in Christian leadership, have succeeded in living and ministering from the place where the vertical and horizontal planes of the cross intersect—the nexus of Christianity, compassionate evangelism. Carlos Campo, president of Regent University in Virginia Beach, Virginia, addresses this concern via the lens of the prophet Isaiah: “The undocumented are surely the poor wanderers of our day. Pastors have a moral duty to respond to them as they would any other brother or sister in need.” Albert Reyes, president of Buckner International, believes that pastors and churches that reach out to the immigrant in essence deliver the same redemptive outreach exhibited by the Good Samaritan. Today’s immigrant may represent the most alienated and rejected segment of our society—today’s “least of these.” As with many of today’s divisive issues, Bible-believing North Americans carry a moral and biblical responsibility to offer facilitative platforms that activate the ministry of reconciliation. Evangelicals and Christians committed to spreading the gospel must incorporate prophetic witness that heals communities, ushers in peace, and exalts righteousness and justice. To that end, the kingdom metric of Christian witness lies within the rubric of doing justice, loving mercy, and walking humbly before God. Our mission is to fulfil the Great Commission, equip the saints, make disciples, and worship God in Spirit and in truth. Let Uncle Sam enforce immigration laws while we embrace a church that reaches the lost for Christ. If we exercise the biblical mandate of compassionately reaching out to all people, including immigrants, can a church suffer legal consequences for immigrant outreach, especially if the individuals we minister to are undocumented? The Department of Justice, the Attorney General’s Office, congressional representatives, White House officials, secular adjudicators, and ecclesiastical authorities all agree on one irrefutable fact: biblical ministry and outreach to immigrants, regardless of their status, carries no legal liability. “With the exception of deliberately employing undocumented individuals or transporting them across state lines, which does construe a violation of the law, clergy are uniformly protected by federal and state statutes throughout the United States,” explained Everardo Zavala, National Hispanic Christian Leadership Conference chief legal counsel. There are several principles churches must follow if they are going to successfully reach immigrants. Inner-city and urban churches often have the neighbourhood margins for effective immigrant outreach. Rural churches may need to strategically plan to effectively reach out to the immigrant community with compassion, engaging in activities that include leadership engagement, aesthetics, and community building techniques. Compassion ministries must seek to build trust with the immigrant community by removing cumbersome documentation that may alienate the very community they intend to serve. Since the law protects ministries, they need to minimize bureaucratic practices that alienate rather than engage. For example, while certain food distribution ministries require registration, this does not need to serve as a deterrent for engagement as long as the registration process does not require proof of citizenship or questions surrounding legal status. Nevertheless, the most effective immigrant-focused compassion ministries require minimal disclosure of private information. The vast majority of compassionate outreach services require little to zero documentation. When the church understands that it carries the spiritual and legal authority to assist the immigrant, the potential exists to emerge as the only trustworthy institution in the eyes of the community. Some immigrants feel trepidation and angst toward government agencies that assist in food and needs-specific services. Many immigrants, however, consider the church the sole sanctuary for both spiritual and physical needs. “If immigrants cannot trust the church, who can they trust?” inquired Mauricio Elizondo, Hispanic American Assemblies of God church planter. Gilbert Velez understands firsthand the dynamics of compassionate ministry. Velez is senior pastor of the 2,500-member Mercy Church, an Assemblies of God congregation in Laredo, Texas. Velez also oversees the Hispanic Mega Church Association. “Compassion ministries must begin not just with services, goods and outreach. But to effectively reach and engage the immigrant community, compassion ministries must build trust,” explained Velez. According to Velez, “Any ministry committed to reaching the immigrant needs to employ personnel who speak the language and understand the cultural terrain.” Compassion outreach begins at the leadership level. Any church committed to reaching the immigrant community must include ethnic and immigrant leadership in its governance. This will secure an institutionalized commitment rather than a token or temporary effort. Compassionate immigrant outreach requires branding the outreach in a marketable manner consistent with the colours, fonts and preferences of the community. This requires a simple cultural orientation. Ministries that desire to reach the immigrant communities must understand the basic threads embedded in the ethos of the community, from food to music, colours and particularities. A 101 cultural orientation can result in a great harvest. Compassionate evangelistic outreach must incorporate messaging in both languages. Some ministries exhibit the appropriate spirit but poorly execute the outreach for lack of language friendly resources. For example, a primarily Anglo congregation in Dallas decided to reach out to immigrants with educational resources at the beginning of the school year. They targeted Hispanic families with school-age children. Church staffers rented a parking lot in the heart of the community, set up a truck, and brought in new backpacks stuffed with pencils, notebooks, calculators, and other school supplies. Unfortunately, although they were in the right place at the right time doing the right thing, few families took advantage of the outreach. Why? Ministry organizers discovered after the event that all their advertising was in English. Effective compassionate outreach to the immigrant community requires linguistically contextualizing the mission in both Spanish and English. In short, compassion and culture must intersect for effective evangelism to take place. Compassion-based evangelism stems not from the narrative of a political ideology, but rather from the heart of prophetic witness. Reaching out to immigrants—whether legal or undocumented—may not reflect the agenda of the donkey or the elephant, but it does reflect the agenda of the Lamb. These immigrants stand poised to change the Christian experience by broadening the evangelical agenda, incorporating a transformational missiology, reigniting a prophetic sociopolitical movement, and globally serving as ambassadors of a kingdom culture ethos that reconciles righteousness with justice. Without a doubt, Hispanic and other immigrant Christians in North America will emerge as the fire wall of righteousness and justice in the 21st century against spiritual apathy, moral relativism, and cultural decay. SAMUEL RODRIGUEZ is president of the national Hispanic Christian Leadership Conference and the Hispanic National Association of Evangelicals, America's largest Hispanic Faith Christian organization serving and representing over 34,000 member churches. This article was reprinted with approved edits from the Winter 2012 Edition of Enrichment Magazine with kind permission of the Assemblies of God. Although Statistics Canada reports Hispanic immigration numbers far smaller than those for the United States, some very interesting trends in Canada underscore Rodriguez’s remarks about the serious potential for the salvation of the immigrant community, and by extension, the salvation of the North American church. 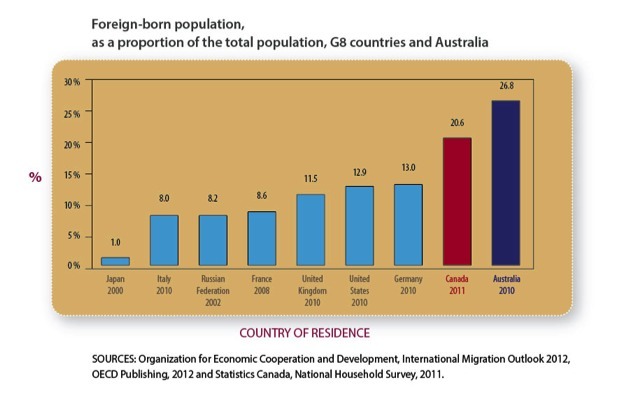 Of the G8 Nations and Australia, Canada ranks second in terms of its foreign born population as a proportion of the total population. Canada is 20.6% to Australia’s 26.8%, followed by Germany at 13.0% and the U.S at 12.9%. Around 1,162,900 foreign-born people arrived in Canada between 2006 and 2011. These recent immigrants made up 17.2% of the total foreign-born population and 3.5% of the total population in Canada. In 2011, nearly 6,264,800 people identified themselves as a member of the visible minority population. They represented 19.1% of Canada’s total population, compared with 16.2% in the 2006 Census. In 2011, 1,567,400 individuals identified themselves as South Asian, the largest visible minority group. They represented one-quarter (25%) of the total visible minority population. Immigration has contributed to a higher share of the population having affiliation with Muslim, Hindu, Sikh or Buddhist religions as well as to a higher share of the population having no religious affiliation. Of the immigrants who came prior to 1971, 2.9% were affiliated with Muslim, Hindu, Sikh or Buddhist religions, whereas 33% of immigrants who came between 2001 and 2011 reported affiliation to one of these religions. As well, 16% of immigrants who came before 1971 had no religious affiliation, compared with 22% among those who came between 2001 and 2005, and 19.5% among those who came between 2006 and 2011. An article from Statistics Canada authored by Bernard, André1 suggests both challenges and opportunities in regard to these immigration trends. For the alert, creative, passionate Church, the fields are ripe. This applies to initiatives in both urban and rural jurisdictions. One trend, which has garnered considerable attention, is the increasing concentration of immigrants in Toronto and Vancouver. The proportion settling in those two cities rose from 43% for those immigrants admitted before 1986 to 61% for those admitted between 1996 and 2001.5 Even though relatively few immigrants are choosing to settle outside the large urban centres, immigration is attracting a great deal of interest from smaller communities. These communities, especially in rural areas, often face declining populations, and immigration can represent a potential means of revitalizing their economies. A more balanced geographic distribution of immigration is generally acknowledged as being desirable.6 Some specific policies have already been put in place to attract more immigrants to rural parts of the country. 1. Frenette, Marc and René Morissette. 2003. Will they ever converge? Earnings of immigrants and Canadian-born workers over the last two decades. (PDF) Statistics Canada Catalogue no. 11F0019MIE. Analytical Studies Branch Research Paper Series, no. 215. 20 p.
2. 2005a. Citizenship and Immigration Canada. 2005. Recent Immigrants in Metropolitan Areas: Canada — A Comparative Profile based on the 2001 Census. April 2005. Catalogue no. MP22-20/1-2005E. 105 p.
3. Picot, Garnett, Feng Hou and Simon Coulombe. 2007. Chronic Low Income and Low-income Dynamics Among Recent Immigrants. (PDF) Statistics Canada Catalogue no. 11F0019MIE. Analytical Studies Branch Research Paper Series, no. 294. 48 p.
4. 2005a. Citizenship and Immigration Canada. 2005. Recent Immigrants in Metropolitan Areas: Canada — A Comparative Profile based on the 2001 Census. April 2005. Catalogue no. MP22-20/1-2005E. 105 p.
5. For example, the federal government recently announced new measures to attract French-speaking immigrants to rural parts of Prince Edward Island. The 2005 Annual Report to Parliament on Immigration has already recognized the potential of “the Provincial Nominee Program for supporting the regionalization of immigrants to centres outside Canada’s three largest cities” (page 18). 6. Immigrants in the hinterlands. Perspectives on Labour and Income. Vol. 9, no. 1. January. Statistics Canada Catalogue no. 75-001-XIE. on the 2001 Census. April. Catalogue no. MP22-20/1-2005E. 105 p.